Wonderful to read news of the first concert of the Palestine National Orchestra under a Swiss conductor in the West Bank city of Ramallah. But the media feeding frenzy around the event did start me thinking. 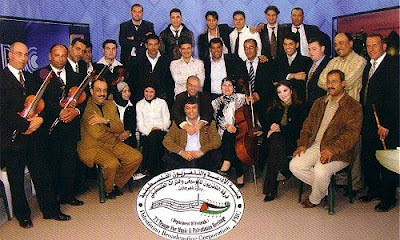 Last year I ran a post about the Gaza based Musical Ensemble of Palestine which was formed back in 2004 and is seen in my photo above. There is a big disparity between the profiles of the two ensembles which is not just explained by their different geographic locations. The new Palestine National Orchestra was reported in the media as playing Mozart, Beethoven (Symphony No 4) and Ligeti plus, in some reports, unspecified Palestinian music. In contrast the Musical Ensemble of Palestine is dedicated solely to promoting the Palestinian musical heritage which draws on Arab music traditions. Which set me re-reading Titi Robin's thoughts on the economic, social and cultural order that prevails in music.